Africa Animals Birds Cappe Juby Bird stamps from Cape Juby. Bird stamps from Cape Juby. Cape Juby is a cape on the coast of southern Morocco, near the border with Western Sahara, directly east of the Canary Islands. 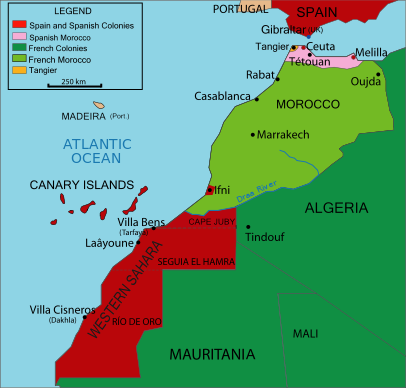 Its surrounding area, called Cape Juby Strip or Tarfaya Strip, while making up presently the far South of Morocco, is in a way a semi-desertic buffer zone between Morocco proper and the Western Sahara, and was a Spanish protectorate in the first half of the 20th century. On March 1, 1799, Slimane of Morocco signed an accord with Charles IV, in which he recognized that the Saguia el Hamra and Cape Juby regions were not part of his dominions (Art. 22). In 1879, the British North West Africa Company established a trading post named Port Victoria. On March 26, 1888, Moroccan soldiers attacked the post, killing the director of the factory and leaving two badly injured. In 1895, the company sold it to the sultan of Morocco. n 1912, Spain negotiated with France (who controlled the affairs of Morocco at the time) for concessions on the southern edge of Morocco, and on July 29, 1916, Francisco Bens officially occupied for Spain the Cape Juby region, that became the South Zone of the Spanish protectorate of Morocco, separated from the main North Zone by the French protectorate of Morocco. As a matter of fact, however, it was administered by Spain together with Spanish Sahara as a single entity. The Spanish area 12,700 sq mi (33,000 km2), and had a population of 9,836. Its main town was founded by the Spanish as Villa Bens, now called Tarfaya. Villa Bens was used as a staging post for airmail flights. When Morocco became independent in 1956, it asked for the cession of Moroccan areas controlled by Spain. After some resistance and some fighting during 1957 (the Ifni War), the Cape Juby strip was ceded by the Spanish government to Morocco in 1958. Bird stamps from Cayman Islands. Bird stamps from Caribbean Netherlands. Bird stamps from Cayes of Belize. 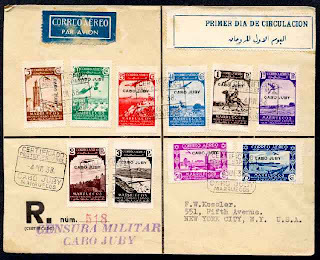 Bird stamps from Cape Verde Islands.